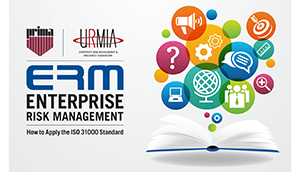 URMIA and PRIMA are pleased to offer an Enterprise Risk Management (ERM) training featuring concurrent ERM training tracks: Public Sector and Higher Education. Crafted by risk management experts, the training uses the ERM international standard, ISO 31000, to teach public entities how to strategically manage risks by creating an organizational understanding of risks and inter-dependencies. The training will equip attendees with the knowledge, skills and ability to effectively measure performance, reduce cost, mitigate exposures and exceed organizational goals. The desired outcome is to establish long-term enterprise-wide resiliency in public entities. Participants engage in hands-on group learning, timely ERM case studies and valuable dialogue with their peers and ERM training instructors. The next training takes place March 13-14 at the Linq Hotel in Las Vegas, NV. Early-bird registration deadline: February 12, 2019.